Keep your drinks cool in style this summer with Personalized Koozies ONLY $5.99! 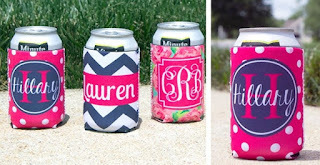 These adorable personalized koozies make a perfect &amp; affordable favor for a birthday party, girls' weekend, bachelorette partys or for a beach getaway! $2.99 for the first item and $0.75 for each additional item. US only. Estimated to ship by Jun 20.